The Bank at the Bellagio has become known as one of the most desirable cosmopolitan nightclubs in Las Vegas. The Bank is very upscale and pretty expensive, but many find its high class allure worth the expense. Everything at The Bank symbolizes high class and elegance. The meticulously designed space encompasses everything a guest at the Five Diamond rated Bellagio has come to expect in nightlife. The Bellagio’s nightclub experience begins with an escalator ride up and walk through an intimate foyer area. This also acts as a way of keeping the crowding to a minimum outside the club, but on busy weekend nights there can still be line of partygoers stretching out into the Bellagio. The Bank has this elegance that is incomparable to any other club in Las Vegas. The Bellagio’s Nightclub has these perfectly placed gold accents, and they intentionally contrast a darkness that most clubs attempt and few really embrace. The Bank’s darkness is executed perfectly! The way the club is designed keeps you looking toward the dance floor whether you’re at a table right next to it or on the upper level gripping the railing. There is so much attention to detail at The Bank that even the bottle service can be considered the definition of class. The alcohol is delivered by two hosts in a giant, glowing, blue diamond, and it’s lifted overhead as if it were the throne of royalty. Getting bottle service at Bank is worth every penny because it’s a classic club from people who know luxury. Bank has a dress to impress attitude so youll get to be able to dress up and have fun in a place where everyone brings their money bags. But don’t worry if you don’t have a ton of cash to deposit because that’s where we come in! Las Vegas guest list will get you and your group in for free! Ladies also get a free drink. 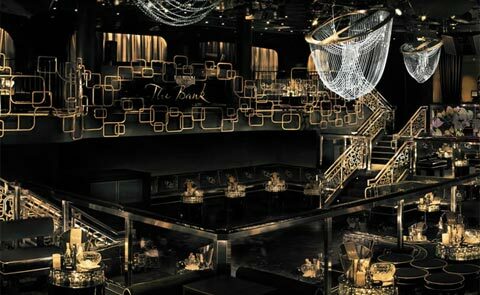 Check out our Events Calendar and see what’s happening at Bank Nightclub Las Vegas and view the Dress Code!